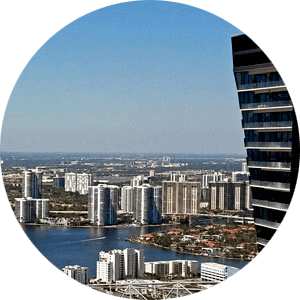 Uniquely located on one of the last 4.5 waterfront acres in North Miami Beach, The Harbour complex has a direct view of the Oleta River as well as the skyline of Sunny Isles Beach and Miami. No detail has been overlooked, down to a private beach located by the waterfront. Enjoy the watersports, marina, take a dive in the pool, The Harbour is your private retreat away from all the noise and commotion. Residences at the Harbour offer spacious Floor Plans with some of the best direct open views of the Intracoastal waterfront and skyline in the City of North Miami Beach. 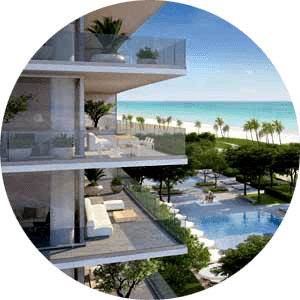 Some of the features of the condo building include a full-service marina, five-star amenities with state of the art spa and flor through design. As well as activities center, tennis court, and a pool deck. This is a prestige waterfront condo complex that offers best for both the beach and the bay. Take a look at these stats, condos for sale in The Harbour building range in price from $400 to $700 dollars per square foot and are a great investment. Two towers, each 32 stories high in The Harbour condo building offers endless views of the Intracoastal and Oleta River. With a total of 426 units between the two towers, Harbour condos boutique complex. Open air arrival courtyard, exotic woods, tropical lush gardens and serene water features blend seamlessly with your residence. Condos in The Harbour are located on Biscayne Blvd surrounded by lush tropical gardens walking distance to the some of the nearby restaurants and amenities. A short drive to area beaches or catch the bus to the nearby Aventura Mall or The Shops at Bal Harbour. The convenient location of The Harbour complex make it such a desirable place to live, and at such a low price for new construction and all the amenities makes luxury affordable. Enjoy the best of nature and the outdoors in a place unlike any other. A lifestyle unmatched anywhere else in the world. Everything you need. Everything your heart desires. It’s all right here. The Harbour makes the entire Miami experience yours like never before. The Harbour North Condo Bldg.